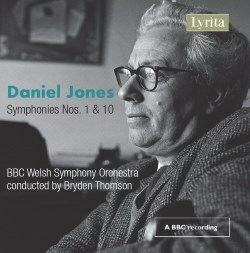 Lyrita have had two fine and valuable CDs of symphonies by Daniel Jones in their catalogue for some time. On SRCD326 the Sixth (1964) and Ninth (1974) were coupled with the choral work The Country Beyond the Stars (1958) (review). There the Ninth was in the hands of Bryden Thomson while the remainder of the programme was conducted by another great champion of British music, Sir Charles Groves. The Groves performances were licensed from EMI while Thomson’s account of the Ninth was a BBC Artium recording first issued on a commercial LP. On SRCD329 Groves conducted Symphonies Four (1954) and Seven (1972), again in EMI recordings, while Thomson was in charge for the Eighth Symphony (1972) in a BBC recording (review) originally issued on the same BBC Artium LP as the Ninth. Now Lyrita have licensed BBC broadcast recordings of Thomson in the First and Tenth symphonies. That will be great news for admirers of this Welsh symphonist. There are further glad tidings to impart: a note in the booklet reveals that during 2017/18 Lyrita plan to issue BBC studio recordings of the Second, Third, Fifth, Eleventh and Twelfth symphonies, all performed and broadcast by Thomson and the BBC Welsh Symphony. Composition of his First Symphony occupied Daniel Jones between 1944 and 1947. He scored it for a fairly conventional orchestra consisting of double woodwind, plus a third flute, four horns, three each of trumpets and trombones, tuba and strings. The only percussion instruments deployed are timpani. It’s in four movements of which the first and last are cast in sonata-form. It is, by some distance, his longest symphony but though his symphonic writing subsequently became much more succinct and concise I don’t believe that the First is bloated or over-long. On the contrary, it seems to me to be very well organised. In describing both this work and the Tenth I should acknowledge my debt to Paul Conway’s excellent notes which guide the listener through both symphonies in an expert and clear manner. The main theme of the first movement is announced immediately and it’s one that strikes me as being full of possibilities. Right from the outset there’s productive tension in the music. The second theme, announced by the violins (2:34), is also a fine one; it’s expansive and lyrical. The development section (from 5:50) is purposeful and full of interest; all sections of the orchestra are very fully engaged. The principal theme is especially important in the recapitulation. Worthy of note, too, is a rhythmic figure which put me in mind of the first movement of Beethoven’s Seventh; this is frequently heard during the movement and especially so in the development. Mr Conway rightly draws attention to the writing first for the flutes (14:29) and then the muted horn section just before the close. At the very end Jones reprises the principal theme as heard at the outset. Conway says that Jones was never to repeat such an “orderly but restrictive gesture” in his symphonies. It may be fair to describe the device as “restrictive” but I have to say that I find it makes a rather satisfying QED on this occasion. The slow movement opens with a serious theme which has something of a noble air. Once again it seems to me to be a genuinely symphonic theme, capable of interesting development. Indeed, Jones exposes it at some length – and very effectively, with a most resourceful use of dark orchestral hues. As a result we have to wait until 4:48 for the oboe to announce the second theme but it’s worth the wait for this theme, too, is an excellent idea. A fugal passage (from 7:08) paves the way for a big climax. Jones is not done yet; after some eloquent writing for strings and for woodwinds another, larger climax is achieved (from 12:34) before the movement achieves a quiet close. The scherzo is in quintuple time and the irregular pulse enhances the interest. The movement is energetic but light on its feet; it’s witty and wittily scored. I may be wide of the mark but the music seemed to me to have a Beethovenian feel. The trio (3:35) is much more relaxed – I think Paul Conway’s reference to Bruckner is justified – and I like very much Jones’s bridging passages into and back out of the scherzo. This is a super movement. Keep your ears peeled at the start of the finale because the first three notes, voiced by the double basses, provide the thematic key for everything that follows. An extended slow introduction culminates in a solo trumpet call. Shortly thereafter (2:46) the main allegro is upon us. Here dotted rhythms are dominant, impelling the music forward. After a slow, mysterious transition based on the three-note cell (5:50), the second theme has similar rhythmic impulsion. Jones interrupts the movement’s energetic progress with a slow interlude based on the introduction to the finale (7:45-9:24). After this the principal allegro subject returns, the punchy rhythmic drive recalling Beethoven once again. At the very end the three-note cell is proclaimed fortissimo. More than three decades separate the Tenth Symphony from the First and it was a very shrewd move to couple them. In the intervening years Jones’s symphonic syntax had become much more concise – the longest movement in the Tenth, its slow movement, plays for just 7:00 whereas all the movements of the First, apart from the scherzo, last for well over ten minutes. Interestingly, though, whilst the writing was now more succinct Jones had become much more expansive in his orchestration. The Tenth features triple woodwind, including some doubling, four horns, three trumpets and three trombones, timpani and strings In addition there’s a substantial array of percussion though the fact that only one player is required to play the nine instruments involved suggests, rightly, that Jones deploys his percussion section with restraint – and to good effect. A tolling tubular bell sets the symphony on its way. The horns immediately introduce the first theme. Much use is made of dotted rhythms and the music conveys a sense of struggle, even strife. The second theme (1:02) is given to the strings and though things are quieter at this point it remains unsettled. The bell tolls again (1:57) to herald the development section and here the music is often angular and at all times restless, building to a powerful if short climax. The second movement lasts a mere 2:01. The marking, Minacciando (menacing) is most unusual; I’ve only seen it once before: in Ian Venables’ anthem Awake! Awake! The World is Young. Jones uses a very irregular pulse and his writing is full of drive and energy. Walton comes to mind here – not least the scherzo of his First Symphony – and perhaps that impression is heightened by the crucial timpani part. The marking for the slow movement is Serioso and that fits the music to a tee. The movement takes the form of a passacaglia in which dark orchestral colourings are to the fore. Thos episode is troubled and, at its climax, impassioned. The concise finale is built on quite angular themes. It’s a powerful movement. At 3:22 we hear the tolling bell again as the coda begins. Mr Conway uses the word “defiant” for the ending of the symphony; there’s no better word for it. Summing up the Tenth Symphony Conway hits the bulls-eye when he says that it “has a troubled, sorrowing quality and a fatalistic ending.” It’s more challenging of the listener than the First Symphony but in their different ways both scores are highly rewarding. Admirers of Daniel Jones should not hesitate to acquire this disc – I’m sure they’ll need no urging from me – but it would seem to me also to offer an excellent introduction to his music for those who do not yet know it. I await the promised future releases from Lyrita with impatience.